Light and golden with a spicy, citrus edge and a delicate sweetness from the honey. Gently bitter and drying as the hops build. Easy to drink and surprisingly versatile with food. Try it with creamy pasta dishes, fish starters, or mushroom dishes. The first organic beer we tried was terrible. I am hoping the honey helps this one. We have only had one from Fuller, but there are a ton on the list. I also found it interesting that BeerAdvocate, a site that has ALWAYS had every beer I was looking for, was missing this one. Not sure what the deal was… but it wasn’t there. There is one listed with cranberries, but this one is just honey. Organic honey! I had no idea that was hard to find. I guess another reason I need to visit South Africa. This beer will go good after a long day in the office. Let’s get started. In the Glass: It looks like a thin, polished lager. I was confused because on the website (the official Fuller, Smith, & Turner website) they pitch it as a lager when the style is actually a pale ale. Not sure… but it looks like a lager before it looks like a pale. I am a little worried, because the bottle says to enjoy before April 12. Nose: The beer doesn’t have that big of a nose. I don’t pick up the honey until the very end. This is a beer that you want to drink freezing cold, but I am sure more aroma will come as it heats up. But that is a double edged sword… gain aroma but lose flavor on a beer like this. Flavor: The flavor is bland, but the sweetness from the honey really stands out. As I drink this beer, I think about how drinkable it really is. There isn’t much in terms of the mouthfeel or the aftertaste… I would compare this to an infused light beer, like a Bud Light Lime. That’s not a bad thing, because the honey stands out. Mouthfeel: There isn’t much of a mouthfeel here. It is thin, slides across the palate like a light beer, and is gone just like that. There is some subtle dryness toward the end, but that is gone as fast as it gets there. There aren’t as many bubbles as I expected, either. Aftertaste: There isn’t much of an aftertaste here. What aftertaste there is is calm, with some dry honey notes. 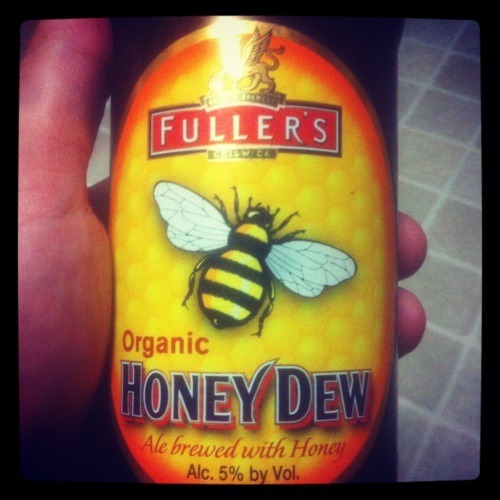 I am not sure I could tell the different between organic honey and regular honey… but it makes me feel better drinking an organic beer, I suppose. This beer is good, but it is not great. I would order it again if the price is right. I would like to have this on tap in a pitcher to share with friends. If this was being served in a restaurant, I hope they throw a little honeycomb on the rim of the glass for garnish. That would be sweet! I’m pretty tired tonight, so my review will probably be pretty straightforward. Sorry about that. Apparently this beer is 1) organic, and 2) not found on Beer Advocate (update – we did find it on there, just spelled wrong), which is pretty unusual. I’m not really sure what to think about that. The beer looks like honey in the glass. It is the color of honey and had about medium amount of head to it – not really a lot, but it definitely had some. It looked kind of carbonated at first, with some little bubbles floating up to the top, but they seem to have mostly died down now, as did the head. The beer doesn’t really smell like honey, but reminds me more of a wheat beer smell. There’s honestly not really a lot of smell to it. So far this beer isn’t really impressing me much in looks or scent. Let’s find out if it tastes any better. Well, the taste seems pretty unimpressive to me as well. Goes down pretty thin, and doesn’t do a whole lot more for me than a domestic beer. The label and name of the beer make me think of honey, as does the color. There is no honey in the taste at all, though. This beer seems to be mostly just another boring ale. Which I guess is okay if that’s what you like. It’s not really my cup of tea, though. I probably wouldn’t buy this beer again, if I even remembered that I had it before.